Aloe komaggasensis Kritzinger & Van Jaarsv. Range-restricted taxon (EOO < 500 km²), recorded from at least one, and possibly one other location. It is potentially threatened by overgrazing and removal of plants from the wild by succulent collectors. The subpopulation at the type locality consists of about 200 plants. Namaqualand escarpment to the east of Komaggas. Succulent karoo-renosterveld transitional vegetation. Rocky slopes of quartz koppies. There is a potential threat of the habitat being degraded by overgrazing by goats and it is also potentially threatened due to removal of individuals by succulent collectors. According to Ernst van Jaarsveld (pers. comm. 2008), the population at the type locality is not under threat from overgrazing and he has not yet observed signs of plants being removed by succulent collectors. Plants appear to mainly divide vegetatively. Little recruitment has been observed. 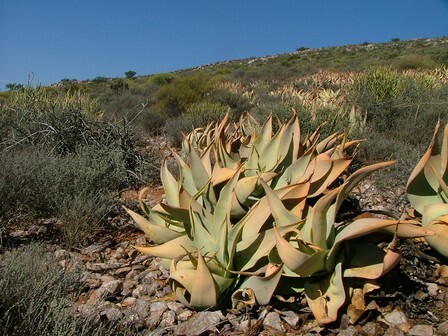 The subpopulation at the type locality is small, consisting of about 200 plants (monitored by G. Nicholson and E. van Jaarsveld in 2008). Glen, H.F. and Hardy, D.S. 1987. Nomenclatural notes on three southern African representatives of the genus Aloe. South African Journal of Botany 53(6):489-492. Grace, O.M., Klopper, R.R., Figueiredo, E. and Smith, G.F. 2011. The Aloe names book. Strelitzia 28. South African National Biodiversity Institute, Pretoria. Van Jaarsveld, E.J. 1985. 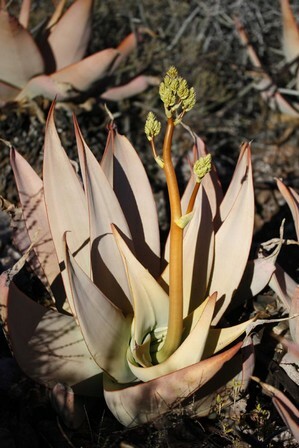 Aloe komaggasensis: a new species from the northwestern Cape. South African Journal of Botany 51:287-289.